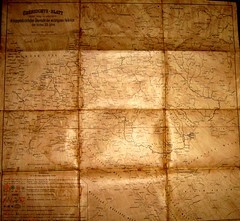 Since time immemorial accurate maps have been crucial to attaining and keeping power. Navigational maps helped first the Portuguese and Spanish, then the English to reach (and annex) new territories across the globe. Later colonialism literally redrew the map of Africa, creating countries where there were none before. Maps are critical in battle and to take stock of your resources and population. So control of maps brings control over your subjects. As we move into a mobile device dominated future this explains the enormous battle to command mapping in your pocket, using the power of GPS and network connections to find out where you are. Nokia spent $7.7 billion on NAVTEQ, while Google StreetView has seen the search giant survey the world at a granular level. It explains why Apple ditched Google and launched its own ill-fated Maps app on the latest iPhone – the company simply didn’t want to give up control of such vital data to a third party. Essentially knowing where you are enables companies to better understand your behaviour and target offers that fit your location and background. And that’s the positive news – it now only takes four location data points to identify a mobile user according to new research. Something that law enforcement agencies (and criminals) are no doubt very interested in. But for all its benefits GPS isn’t as accurate as mapping companies (and advertisers) would like. Particularly in large buildings, such as shopping centres, it doesn’t give pinpoint positioning. Which is why Apple has just paid a reputed $20m for indoor mapping specialist Wifislam, which uses ambient wifi signals to offer maps accurate to 2.5m. With this level of data clever marketers could target you with an offer for Costa as you walk into Starbucks while the police could place you (or at least your phone) at the scene of a crime in a crowded city. Apple isn’t alone in looking at indoor mapping – Google now features 10,000 floor plans submitted by businesses while Nokia’s Destination Maps product has more than 4,000 locations in 38 countries. I often bang on about privacy and how marketers need to tread a fine line between providing targeted offers and respecting personal space. And the move to indoor mapping, combined with ways of interacting such as QR codes, augmented reality apps such as Aurasma and Near Field Communications (NFC) mean that the possibilities of tracking, understanding user behaviour and tailoring marketing could become ubiquitous. Except in the countryside, where poor mobile coverage means that if you are lucky it tells you what village you’re actually in. The future is hyperlocal and mobile – marketers need to embrace this, but make sure that they’re getting buy-in from customers or they risk a privacy backlash from both individuals and regulators.